You've added Canal Grande, Piazzale Roma, Ponte di Rialto, and other attractions to your itinerary. On the 29th (Sat), steep yourself in history at Piazzale Roma, explore the activities along Canal Grande, snap pictures at Ponte di Rialto, admire the landmark architecture of Doge's Palace, then steep yourself in history at Ponte dei Sospiri, and finally get to know the fascinating history of St. Mark's Square. To see traveler tips, more things to do, ratings, and other tourist information, read Venice trip builder . Skopje, Republic of Macedonia to Venice is an approximately 5.5-hour flight. You can also do a combination of flight, shuttle, and train; or drive. Traveling from Skopje in June, expect somewhat warmer with lows of 20°C in Venice. You will have some time to spend on the 30th (Sun) before leaving for Garda. 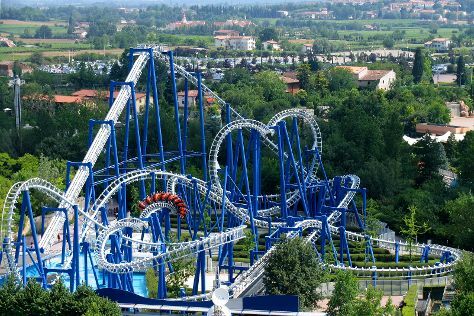 Your day-by-day itinerary now includes Rocca Scaligera di Sirmione, Lido Cappuccini and Gardaland Park. On the 30th (Sun), explore the historical opulence of Rocca Scaligera di Sirmione, get outside with Lido Cappuccini, and then get in on the family fun at Gardaland Park. Plan trip to Garda with our itinerary maker to find out where to go and what to do. Traveling by car from Venice to Garda takes 2 hours. Alternatively, you can take a train; or take a bus. June in Garda sees daily highs of 33°C and lows of 20°C at night. You'll have a few hours on the 1st (Mon) to wrap things up before traveling to Florence. Your day-by-day itinerary now includes Uffizi Galleries, Piazza della Signoria and La Bussola Free Tours. On the 1st (Mon), gain interesting insight with La Bussola Free Tours, explore the world behind art at Uffizi Galleries, contemplate the long history of Loggia dei Lanzi, don't miss a visit to Ratto della Sabina, then don't miss a visit to Piazza della Signoria, and finally appreciate the extensive heritage of Piazza del Duomo. To see photos, ratings, where to stay, and other tourist information, you can read our Florence road trip app . Drive from Garda to Florence in 3 hours. Alternatively, you can do a combination of bus and train; or fly. In July in Florence, expect temperatures between 35°C during the day and 21°C at night. Finish your sightseeing early on the 2nd (Tue) to allow enough time to take a train to Pisa. Kick off your visit on the 2nd (Tue): admire the landmark architecture of Leaning Tower of Pisa, steep yourself in history at Battistero, and then contemplate in the serene atmosphere at Duomo di Pisa. 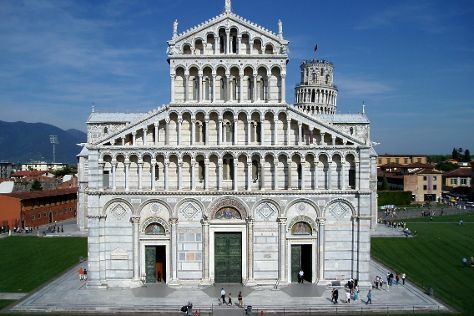 To find reviews, photos, maps, and more tourist information, go to the Pisa online trip builder . Traveling by train from Florence to Pisa takes an hour. Alternatively, you can drive; or take a bus. July in Pisa sees daily highs of 35°C and lows of 21°C at night. On the 2nd (Tue), wrap the sightseeing up by early afternoon so you can drive to La Condamine. La Condamine is the central Ward in the Principality of Monaco. You've added Cathedrale Notre-Dame-Immaculee, Champions Promenade, The Palace Guards, and other attractions to your itinerary. For traveler tips, maps, where to stay, and other tourist information, read La Condamine trip site . Getting from Pisa to La Condamine by car takes about 4 hours. Other options: take a train; or do a combination of flight and train. When traveling from Pisa in July, plan for little chillier days and a bit warmer nights in La Condamine: temperatures range from 32°C by day to 25°C at night. Wrap up your sightseeing on the 3rd (Wed) to allow time to travel to Eze. Hillside villages along the Mediterranean coast don't come more picturesque than Eze, attracting vacationers with its perfectly preserved medieval streets, colorful botanical gardens, and sweeping sea views. You've now added Parfumerie Fragonard - L'Usine laboratoire to your itinerary. To see other places to visit, photos, reviews, and tourist information, read Eze online day trip planner . Eze is just a short distance from La Condamine. In July, daily temperatures in Eze can reach 32°C, while at night they dip to 24°C. Wrap up your sightseeing by early afternoon on the 4th (Thu) to allow time for the car ride to Nice. Nice is known for museums, historic sites, parks, shopping, and nightlife. Your plan includes some of its best attractions: kick back and relax at Castel Plage, don't miss a visit to Place Massena, and get great views at Colline du Chateau overlook. To find reviews, other places to visit, photos, and other tourist information, read our Nice trip itinerary planner. Nice is just a short distance from Eze. 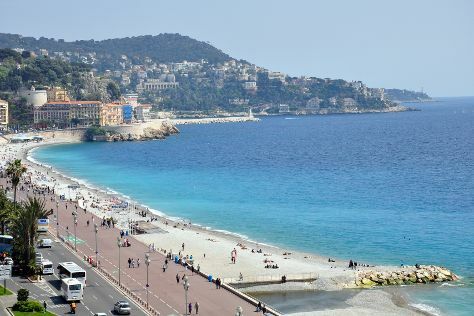 In July, daily temperatures in Nice can reach 32°C, while at night they dip to 25°C. On the 7th (Sun), you'll have the morning to explore before heading off to Antibes. Your day-by-day itinerary now includes Plage Antibes. On the 8th (Mon), kick back and relax at Plage Antibes. To see maps, ratings, traveler tips, and other tourist information, read Antibes day trip website . Antibes is just a short distance from Nice. In July in Antibes, expect temperatures between 32°C during the day and 24°C at night. Wrap up your sightseeing by early afternoon on the 8th (Mon) to allow enough time to take a train to Cannes. For more things to do, maps, photos, and tourist information, refer to the Cannes trip planning app . Cannes is very close to Antibes. Expect slightly colder evenings in Cannes when traveling from Antibes in July, with lows around 21°C. 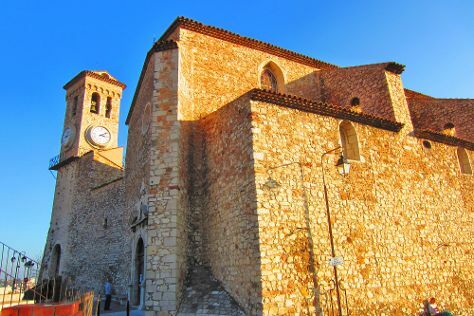 Wrap up your sightseeing on the 7th (Sun) early enough to drive to Saint-Tropez. Saint-Tropez is a town, 100km west of Nice, in the Var department of the Provence-Alpes-Côte d'Azur region of southeastern France. On the 7th (Sun), take a stroll through Vieille Ville. For maps, other places to visit, reviews, and more tourist information, go to the Saint-Tropez online trip builder . Traveling by car from Cannes to Saint-Tropez takes 1.5 hours. Alternatively, you can do a combination of train and bus. When traveling from Cannes in July, plan for a bit warmer days and about the same nights in Saint-Tropez: temperatures range from 38°C by day to 20°C at night. Wrap up your sightseeing by early afternoon on the 9th (Tue) to allow enough time to drive to Annecy. Lac d'Annecy has been added to your itinerary. On the 10th (Wed), explore the activities along Lac d'Annecy. For where to stay, photos, maps, and tourist information, read Annecy trip itinerary planning tool . Getting from Saint-Tropez to Annecy by car takes about 5 hours. Other options: do a combination of flight and bus; or do a combination of train, flight, and bus. While traveling from Saint-Tropez, expect slightly colder days and about the same nights in Annecy, ranging from highs of 31°C to lows of 18°C. You will have some time to spend on the 11th (Thu) before leaving for Geneva. Your day-by-day itinerary now includes Palais des Nations, Genève, The Geneva Water Fountain and The Flower Clock. Kick off your visit on the 11th (Thu): make a trip to The Flower Clock, then ponder the design of The Geneva Water Fountain, then ponder the world of politics at Palais des Nations, Genève, and finally stroll through Ariana Park. To see maps, traveler tips, ratings, and other tourist information, refer to the Geneva travel route planner . Traveling by car from Annecy to Geneva takes an hour. Alternatively, you can take a bus; or take a train. In July, daytime highs in Geneva are 32°C, while nighttime lows are 17°C. Wrap up your sightseeing on the 11th (Thu) to allow time to travel to Konstanz. Your day-by-day itinerary now includes Lake Constance. To see photos, more things to do, other places to visit, and more tourist information, go to the Konstanz itinerary planning tool . Getting from Geneva to Konstanz by car takes about 4 hours. Cap off your sightseeing on the 12th (Fri) early enough to go by car to Munich. 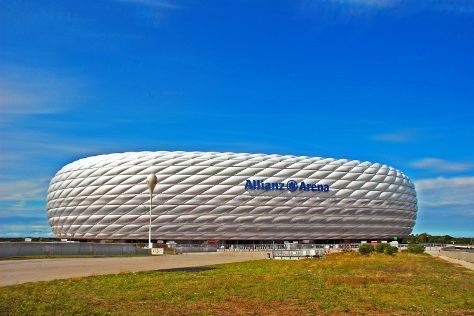 Your day-by-day itinerary now includes Allianz Arena. On the 12th (Fri), explore and take pictures at Allianz Arena. For photos, where to stay, ratings, and other tourist information, refer to the Munich trip builder site . Drive from Konstanz to Munich in 3 hours. Alternatively, you can take a bus; or do a combination of train and flight. In July in Munich, expect temperatures between 29°C during the day and 15°C at night. Wrap up your sightseeing by early afternoon on the 12th (Fri) to allow time for the train ride to Innsbruck. Swarovski Crystal Worlds has been added to your itinerary. For where to stay, other places to visit, reviews, and tourist information, read Innsbruck online tour itinerary planner . You can take a train from Munich to Innsbruck in 2 hours. Other options are to drive; or take a bus. In July, plan for daily highs up to 30°C, and evening lows to 16°C. Wrap up your sightseeing by early afternoon on the 13th (Sat) to allow enough time to travel back home.